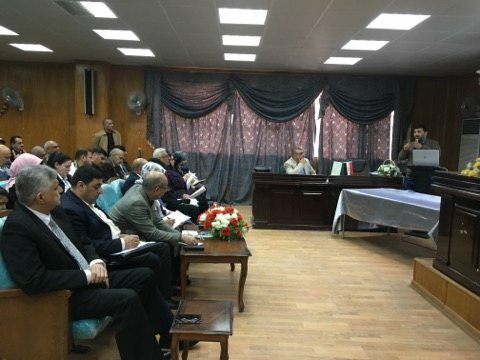 The Department of Scientific Affairs and the Division of Studies, Planning and Following-up in the college of Basic Education and in cooperation with the Department of total Quality and University Performance organized a workshop on the meddlers system. The workshop deals with the prescribed model of the study plan and how the material ratios can be calculated and how materials can be coded in addition to the form of registering and dropping of the materials course. The workshop was presented by Dr. Mohannad Abdul Mahdi / Head of total Quality and University Performance assit lectrer. Mustafa Abdul Al-Sattar, Director of the Scientific Affairs Department on ibn al – nafes hall the workshop witnessed the presence of the Dean of the College, Dr. Amer Yasir Khudair, the heads of departments and members of the scientific committees and a group of departments instructors. The workshop dealt with four prospects. The first one includes a work plan of the allotted time the preparation of the meddlers system sent by the Studies, Planning and Following-up directorate. .the second one includes the presentation of a study plan according tomeddlers system, while the third one how the materials cam be coded in themeddlerssystem, and in the last one presented forms of registration and dropping in addition to the graduation document for the student according to this system. The workshop recommended to complete what is required according to plan and readiness to complete the study plans according to the model and in the specified period of time. It also recommended the withdrawal of the models presented and approved in coding materials according to international standards.